Yes, I said it. BAH HUMBUG. I love Christmas as much as the next home-decor blogger; but for me, Christmas decorating always comes with a bit of a catch. I like my neutral tones. I like my black, whites and taupe. I would be perfectly content if Rudolph invested in a good mattifying concealer and Santa came down the chimney in a sooty, dovetail suit. One more time— Bah humbug. But alas, Christmas colors are red, green and (occasionally-if-never) white. So here I am; year after year, expected to dress my home with candy apple and wintergreen felts, fabrics, ribbons and lights– colors that I may be able to stomach for the first week or so, but I would grow tired of by the 25th. Countless variables in the traditional holiday pallet easily risk the curation of a miss-matched, kitschy vibe; or worse, straying across the fine line which separates “festive” from “gaudy”. My personal solution? Mixed metallics on white or neutral backdrop. It’s hard to go wrong with glistening, gold tinsel and shining, silver bells. There’s a reason they wrote carols about the earthly value Silver and Gold. 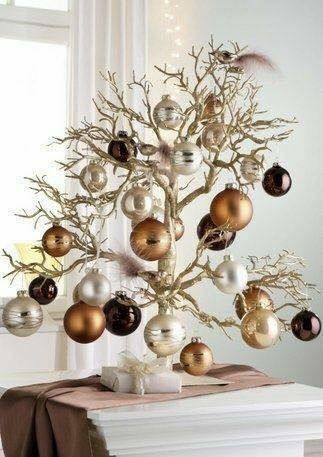 Metallics are undoubtedly the unsung heroes of holiday decorating. But this pallet choice is not a holiday-isolated design option. Mixing metals is a year-round, budget-friendly stylistic choice which can be applied to a wide range of interior design plans. To be fair, there *is* a camp of home decorists (my mother included) which may have a negative thing to say about this pallet choice. There was a time where style forbade silver earrings with gold necklaces; but as with all trends, this rule has shifted to “allow” a more eclectic collection to appear in one space. Whether its apparent in the kitchen, the bathroom or living spaces– mixed metals are starting to appear throughout the home. And though white, gold and silver is a foolproof Christmas decor strategy– a little extra attention should be paid to the following concepts while designing for year-round casual spaces. Here are a few tips to keep in mind when applying the mixed metals trend to your home. When building the color scheme of an interior space, one common approach for creating drama is to focus on leading color, then gradually add the supporting colors to accentuate or dampen details. The same goes for mixing metals. Having equal parts of silver, gold, brass, copper, AND bronze within a singular space will allow none of the individual pieces to shine. Instead, you’ll most likely be left with a harmonious balance– which isn’t necessarily a bad thing; but will give you a different (more subtle) final result. A common misconception: METALLIC IS NOT A TEXTURE. Metal can *have* texture; an important nuance to keep in mind when curating your space. Much like how your paint can be gloss, satin or matte finish; metals also have a finish about them which can drastically add to any visual collage. Is the metal shiny like chrome? Rustic and matte like cast iron? Somewhere in-between like a brushed finish? Even cast into a ornamental patterns creates a texture all its own. Mix textures while mixing your metals can create a defining barrier between your metal tones, sharpening the contrasting moments and allowing the quiet notes to blend seamlessly. One easy way to make sure the metals within a space stays cohesive is to select a temperature range to stay within. On the other hand, this also creates the opportunity to create drama with a contrasting piece. If you opt to create a warm-tone space with golds, coppers and bronzes; anything cool tone will become a instant focal point. Similarly, one gold piece is bound to stand out among chrome, iron and gunmetals. Be mindful of this opportunity, and aim (or avoid) accordingly. When mixing most anything for interior design purposes, contrast will bring attention while an even balance will keep the mixed concept subtle. Whether you apply this to you choice in metals, the texture of the metal or the temperature vibrancy– this formula continues to apply. With this simple tip in mind, you’ll still end up with your desired drama or subtly– whichever way you choose to go!